Updated on 26-Jun-2018 with new pics (some old still there) and content. Eggs have high quality protein and are rich source of Vitamin D which helps to protect bones. They are filling and when enjoyed for breakfast may help with weight management, as they have high protein content which helps us to feel fuller for longer. Egg Biryani, which is a combination of Rice, Egg and masala made from Onion, Tomatoes make it a complete healthy and nutritious meal. Rice has the ability to provide instant energy. By experience I have seen that the flavour of any Biryani is enhanced after a few hours or next day. The same biryani taste better the next day, so I generally cook this a day prior or in the morning If I need it for dinner. 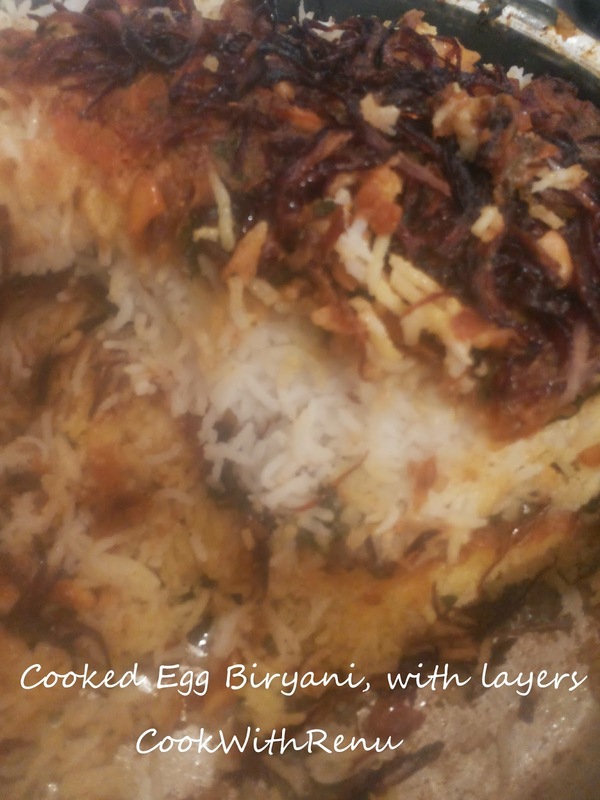 Generally in Egg Biryani one adds the egg whole or just boiled, What I do different is I first cut into half and shallow fry it with some spices so that the egg gets the flavor and taste or else they are bland. 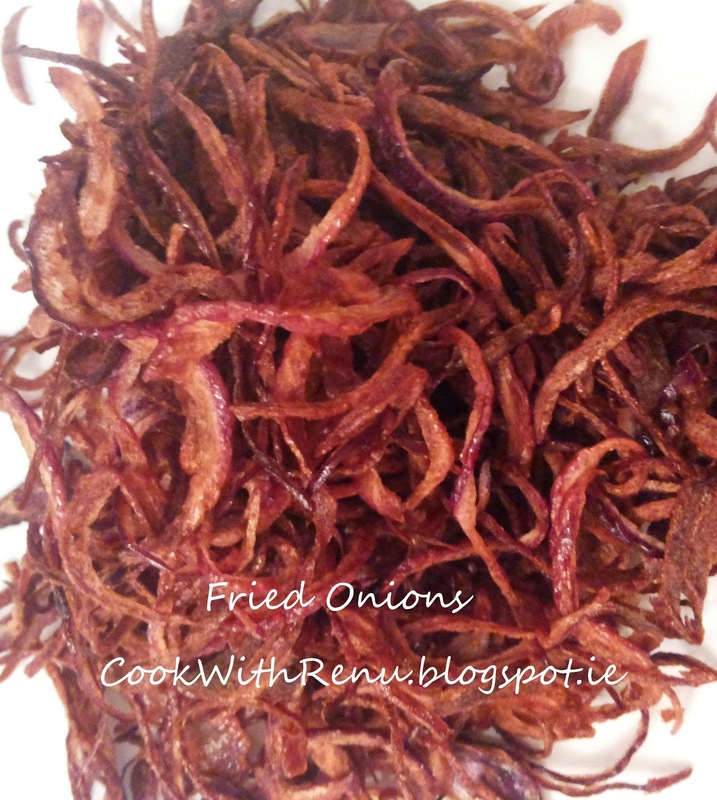 I also add some fried onion’s which add to the taste. I then almost follow the same recipe I use for chicken/mutton recipe which I cook for my husband. I assume it’s close to the taste of non-veg biryani, but with egg. (Assume because I do not know the taste of non-veg as I do not eat.) One can replace egg with paneer and vegetables too, need to give it a try soon. Soak the saffron strands in the milk. Add enough water (to cook the rice) in a pot. Add 1 teaspoon Jeera, 2-3 Cloves (Long), 1 Bay Leaves (Tejpatta), and 3-4 Black pepper (This will make it spicy, but it’s optional) and let it boil. Once it starts boiling put the rice in it and let it cook. Do not cook the rice completely. Let it cook 80-90 percent, as it will cook full when we assemble the biryani. Or Alternatively you can cook the rice in microwave for 15 minutes or depending upon your microwave settings. We want the rice to cook 80-90 percent only. Once half cooked drain the water using a strainer, and immediately add 1 tablespoon of ghee into it and lightly mix it. (Do this very gently as we do not want to break the rice). Ghee adds to the flavor and taste. In another pan heat the oil for frying. Fry the thinly sliced lengthwise onions in it until dark red in color. It almost looks as if it has overcooked or over fried. But we want that. Remove it on a tissue paper. Quickly fry the cashews. Just put in hot oil and remove immediately. This will give them a nice golden color and make them a little more crunchy. Remove it on a tissue paper. In another pan or you can use the same pan, just take 2 tablespoon of oil. Once the oil is heated add 1/2 teaspoon of hing, 1 teaspoon of Red Chilli powder, 1/2 teaspoon of Haldi. and layer the eggs and let it cook for 5 minutes. Turn and again let it cook for 5 minutes. Remove it on a tissue paper. In a Medium sized heavy bottom pan, first layer the masala, (If possible put the bay leaves at the bottom) this helps in not burning the biryani. Then arrange 5-6 pieces of egg, then put a layer of Rice, then the fried onion and Kaju pieces and then sprinkle around 1/3 (if 3 layers) or 1/2 if (2 layers) of the saffron, salt and water mixture evenly. Repeat the above process for the other layers. One can make 2 or 3 layers. Yummy Biryani is ready. Serve it hot. Fell in love with that hot “Bhatura” of yours, one more addition to our no oil tasties! Whoa! Is it butter turning into a wicked “snack”—“Instant Rice butter chakli”? Egg Biryani surely sounds intersting. The dish has turned out great and the way you have decked up those eggs look good..
Lots of ingredients and lots of spices. The end result must have been very flavorful. 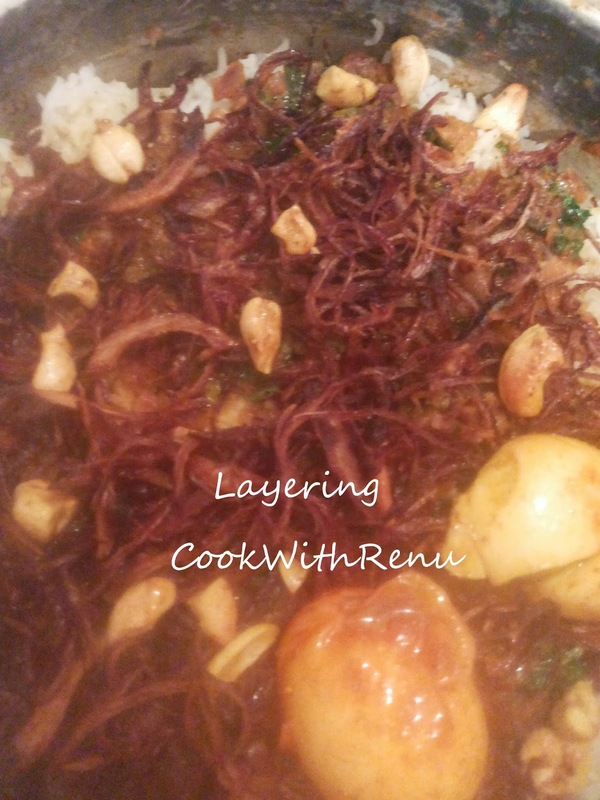 Renu, such a delicious rich looking biryani. I don't cook the boiled eggs again. I should as it looks so pretty and also it would add more flavor to the eggs. I am sure egg lovers would love to have this. Rich looking egg biryani, a real feast for egg lovers. What a treat and am sure this dish will definitely please some hungry tummies easily. I like the idea of frying the egg for better flavour. The biryani looks really flavourful Renu.. Egg biryani looks very inviting and you new pictures are beautiful Renu. Biryani looks so delicious and tasty.